MANCHESTER — Peter Flotz of the Lansing Melbourne Group is scheduled to give the Board of Mayor and Aldermen an update Tuesday on his firm’s progress identifying opportunities for additional parking in the Amoskeag Millyard — including a new proposal for an elevated parking deck to serve a proposed new hotel. Florida-based Bedford Lot Venture LLC plans to build a 125-room Hyatt hotel in the Bedford Street parking lot. The developer proposes splitting the 108-car Bedford Street parking lot in two, with the developer getting a half-acre of land on the west side of the property to build a six-story hotel, which would include a small restaurant such as a Starbucks and other retail space. In a memo to aldermen, Flotz said he has been working with city staff since late last year to finalize a parking lease as required under the purchase and sale agreement. The agreement states the city will receive notice from Bedford Lot Venture LLC when the hotel is 90 days away from completion, and the city is required to construct the parking on the remaining area at the site to provide 60 exclusive spaces and 60 overflow spaces in time for the hotel’s opening. Highlights of the proposal include the creation of more than 250 spaces, including 83 on the proposed upper-level deck that would serve the hotel. Flotz writes the developer will cap the costs to the city at $750,000, and offers to pay $150,000 for the air rights over the site. Bedford Lot Venture LLC would pay all operating and maintenance costs of the elevated deck, and agrees to file for site plan approval within 60 days of execution of an agreement. Aldermen are also scheduled to hear an update on Lansing Melbourne Group’s work to draft an ordinance establishing a special parking assessment district in the Millyard. Late last year, aldermen approved spending $35,000 of economic development money to pay Lansing Melbourne Group (LMG) to conduct a new parking study in the Millyard. According to Flotz, he has identified 857 existing on-street public parking spaces in the Millyard, and 790 off-street public spaces. 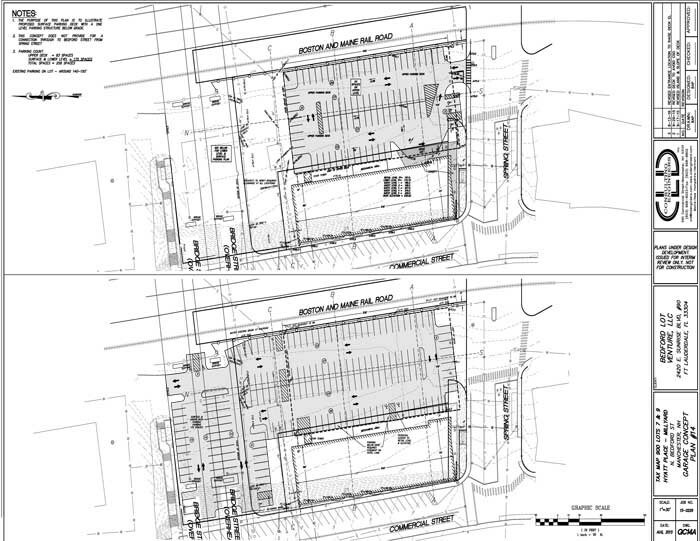 Add in 3,202 private spaces, and Flotz said the total supply of parking spaces in the Millyard comes in at 4,849. LMG has recommended RSA 231 as a possible path to a parking assessment district under state law. RSA 231 requires no approval by property owners within the district. Under this method, a need is identified, a solution proposed, the cost to implement the solution to meet that need is estimated, and anyone benefitting from the solution is assessed based on the benefit they receive. While details of the parking assessment plan have yet to be finalized, the project would involve construction of two mid-sized parking garages, serving an estimated 600 vehicles, at an estimated cost of $18,000,000. The garages are projected to generate annual revenue of $421,200, based on a figure of 540 permits sold at a monthly rate of $65 per space. City aldermen are scheduled to meet Tuesday at 7:30 p.m. in the aldermanic chambers at City Hall. Click here to view the full article on LMG’s upcoming BMA agenda item.